Should you say yes to being part of an upcoming blog tour? Should you have a Black Friday sale? Should you install Google AdSense on your sidebar? When you have an online business, or even just a blog, you begin thinking about these questions and hundreds more. There are big overarching questions like what kinds of products do you want to sell and how do you want to sell them. And there are little day-to-day sorts of questions like what should you post on your Facebook page today. Trying to make all of these decisions by yourself is stressful. There’s no way to do everything and it impossible to know for sure what choice is best. Over the past year I’ve realized that if I develop a set of guiding principles and stick to them I have a much easier time making decisions big and small. I’m less stressed and feel more confident that I’ve done the right thing. I call this approach, “This is how we things here.” It’s a set of distinctive actions that define how I operate and it’s so helpful! A word of warning before I go further. “This is how we do things here” can too easily become, “We’ve always done it this way and we always will.” Remind yourself that over time you’ll need to bend your principles, or even delete and add new ones. Allow your guidelines to shift as you gain more experience and more confidence. It’s entirely okay to change directions. While flexibility is important, flexing isn’t the same as being pushed. Sticking to your guns will help you to avoid saying yes to things you’ll later regret, over promising, or compromising your ideals. Your guiding principles will help you to build a business you can sustain in the long run. I’ve also found that showing people that I have a set of proven processes in place is a really good thing, even if I’m turning them down. There’s a method behind the “no.” I do things in a particular way that’s proven to be successful for my business and can confidently explain why. It works! Most often people will not only understand your reasoning, but will respect you more for it. Last week I got an email from Rocky Taft, the SEO Coordinator for Uncommon Goods. Hope all is well. This is Rocky from UncommonGoods. I recently came across your site while searching for influencers who are a good fit for the following opportunity. I’m currently trying to increase awareness about our ongoing open call for product submissions to present for consideration of our buying team. It’s our mission to continue growing our community of artists and makers and I believe your readers would enjoy learning about us. Are you interested in collaborating on a sponsored post to help spread the word? I don’t write sponsored content on my blog. I don’t get paid in gift cards. I thanked Rocky for his offer, politely turned it down, and moved on with my day knowing I made the right decision. Wendi’s patterns are all sold as PDFs. Last year, she seriously considered producing print patterns to sell at quilt shops. The idea of nationwide print distribution was alluring, but Wendi’s unwavering commitment to providing video content for every pattern helped her decide to stick with PDFs. Video is the way Wendi does things and she uses that commitment to guide her business decision-making. Some guiding principles might be immediately obvious to you right from the beginning. For example, every one of my customers gets a follow-up email from me after their purchase. Customers need to know where to turn if they have questions and how to connect with me further if they wish to. That’s an easy one. Others guiding principles can only be developed over time and through experience. I get invited to sell at lots of craft shows, but after multiple tries I’ve realized that selling my toys at craft shows makes me miserable. With that principle as my guide I’m able to easily turn those invitations down and move on without wondering if I’m making a bad decision. Saying to yourself, “This is how we do things here,” can guide you through all the decision-making that’s involved in a solo venture so that you’ll continue to love your business over the long-term. 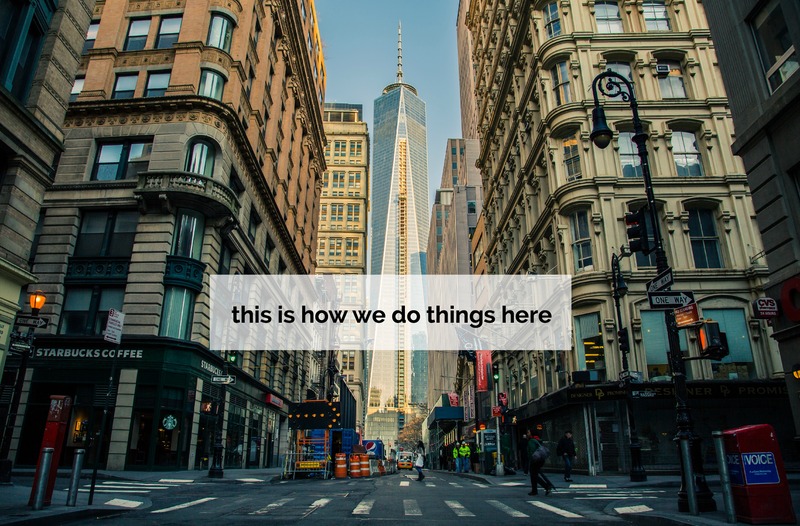 What’s one way you approach your blog or business, talk with your customers, or create your products about which you can state, “This is how we do things here”? Great post! As I am struggling with re-energizing my blog and pattern design venture, this is very helpful to me. Good food for thought. So glad to hear that, Lora. Wish I could have read this last week before I got talked into doing a craft fair this weekend! It sounded like a good idea at the time, but now I am remembering how much I dislike doing them. I will definitely put “no craft fairs” on my this is how we do things here list! It’s funny because I do feel this little twinge of temptation whenever I get invited to do a craft fair. But then I’m always so glad to held fast to my decision not to do them. They aren’t for me and I know that so I can just let it go. Your example in Wendi Gratz is such a positive one; the only one that springs to mind for me is Hobby Lobby. I personally disagree with their political decisions and choose not to shop there, but I do think they have a very strong “that’s how we do it here” ethos n terms of blending religion and mainstream business (closed on Sundays, endorsement of only Christian crafts and products, insurance coverage etc.). Or, at least they like to think they do (I haven’t followed the court case very closely but I know I’v read several instances where they are turning a blind eye to some other income generators that don’t align with the principles they can’t stop shouting about). I love this example and the way you’ve explained it, Stephanie. Hobby Lobby’s rules about how they do things are certainly far from my own, but the have them and they follow them and I think there is something applicable there. It’s funny how people begin suggesting all sorts of things when they see what you’re up to. I think there’s nothing wrong with trying things out. That’s how I figured out that I don’t enjoy doing craft shows. But definitely listen to your gut and if it feels too hurried or not quite right, then hold off until you know for sure where to expend your energy. I love this! Thank you! I crafted a mission statement once upon a time, but I think deconstructing that a bit and turning it into a list of clear cut to-do’s and not to-do’s might be a lot easier to follow day to day. I also feel that twinge of temptation to do more craft fairs, but my prints are just a bit too niche for general audiences and the thought of manning a booth for an entire weekend sounds nearly impossible with little kids. I think a list like this would definitely help ease that guilt of turning down those opportunities. Yes, a whole weekend at a craft fair does sound pretty hard to do with little kids. Don’t feel guilty about turning them down! There are so many ways to be successful. You’ve got to do things in a way that works for both your business and for your life right now. I discovered your website a few weeks ago and I love all of the advice you give for running your own business. I quit my day job about a year ago to run my Etsy label business. after being there for 21 years, It was hard to give up that identity but I love working fulltime in my studio at home and I found that I can be much more creative and free to design what I want than at my old job. Thank you for the guidelines. I too get tempted to do fiber festivals but I know that I regret doing them after I do one because with social media promoting there’s no reason to sit in a booth all day or all weekend when I can sell things 24/7 online. I reeally liked your blog about using Twitter. Yesterday, I started doing your daily suggestions. I look forward to Wednesdays when I can read your weekly newsletter. That’s terrific, Pam! Congratulations on the shift to working on your own business full-time. I’ll bet that was a very scary move! It sounds like you’re really enjoying the creative freedom, though. I hope to see you on Twitter! Abby, another wonderful post that gets me thinking about the direction I want to go in. I have been ‘getting a pattern ready’ for a long time but even though there are folks who want it now, I have this nagging feeling that the foundation isn’t ready yet and perhaps it is better to do it right than right now. Now I need to figure out what that foundation actually consists of…. You’ve totally got to go with your gut. If it isn’t ready, it isn’t ready, you know? And on the day it is ready, you’ll be so proud. I just discovered your website today, as I am in the process of reinvigorating my blog, and hoping to start putting goods for sale on Etsy. This post has really helped me in the knowledge that it is OK to say no to specific projects. I just today had to explain that I don’t do clothing, and am trying to get a friend to understand that I have no experience on quilts made from clothes. I want to label my name as a modern quilter, but specializing in small projects such as baby quilts and table toppers. Thanks so much for offering guidance to quilters of all stages – this is great! Good for you, Amy! Good luck with everything! I like the idea of making guidelines to stick with (that can be bent as need be or as time goes on) and it makes me feel better when I say ‘no I’d rather not do that’ when my kids are coming up with all sorts of suggestions of ‘directions’ I should go and changes I should make. One of my daughters doesn’t like blue and yellow together and has been saying to change the colours for my FB page…but sunshine yellow is my fav colour and the blue makes a good background for photographing my toys as I rarely use that colour when picking fabric so there is more chance of the images coming out well when pics are taken so I am sticking with my chosen ‘theme, branding color scheme for a reason. Like you say I have to be comfortable with my choices they need to suit me and my circumstances (limited Internet use MB wise and time issues etc etc) so I am even more determined now not to agree just because someone else says ‘you should do this’…..thanks. Abby, I just want to thank you for your wonderful newsletter and great posts like these. Making patterns takes so much time and so much behind the scenes work (as do blog posts–I put hours of energy and time into mine). It’s so easy to get caught up in enthusiasm or certain trends (in sewing, blogging, social media, whatever) but having these background principles is so important. I’m still forming my guiding principles… but I do have one clear phrase for myself and whenever I get muddy about a certain commitment, I go back to that phrase and it straightens me out.